A case report describing the removal of a painful fibular sesamoid is described. This case represents a comminuted fibular sesamoid fracture with radiographic evidence of avascular necrosis. After failed attempts at conservative treatments, the surgical approach, postoperative treatment and prognosis is discussed. Unlike the tibial sesamoid, excision of the fibular sesamoid appears to have a better long-term prognosis. Surgical resection of a sesamoid was originally described in 1904 by Inge. There are several etiologies of sesamoid pain. The most commonly encountered are avascualr necrosis, symptomatic bipartite sesamoid, fracture/trauma, osteomyelitis, or osteoarthritis.10 Surgery is usually reserved until all conservative treatment has been exhausted and there is continued pain under the sesamoids. We report on a case of fibular sesamoid arthritis refractory to conservative treatment and subsequent resection of the fibular sesamoid. Figure 1 This view shows a comminuted fracture of the fibular sesamoid with sclerotic margins of the bone consistent with avascular necrosis. MRI report was unavailable for review. Surgical fibular sesamoid excision was agreed upon since all conservative measures had been exhausted. The patient’s medical history includes hypertension and breast cancer. Physical exam reveals mild hallux valgus with edema to the left first and second metatarsophalangeal joints plantarly with positive pain on palpation and pain upon extension of the first and second metatarsophalangeal joints. Figure 2 Removal of oversized-fractured sesamoid. Here, plantar bone growth and calcificiation can be seen adding to the patient’s painful symptoms. Figure 3 Once the fibular sesamoid is removed, articular erosion is visualized along the metatarsal head. This region can be scored with a k-wire to promote fibrocartilage repair. After removal of the fibular sesamoid, this articular cartilage was also found to be eroded and the morphology was lobulated. A small drill was used to score the rough area of the fibular sesamoidal groove. Closure was performed in layers. 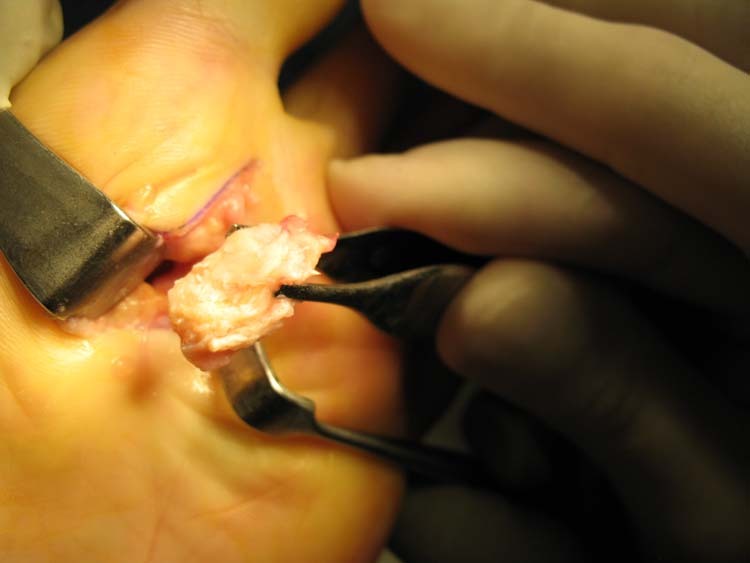 In our experience the defect created by removal of the sesamoid was adequately resolved by a standard technique of closure in layers. Incision has been described dorsally and plantarly. Advantage of a plantar incision is the close proximity to the sesamoid, however there is a higher risk of injury to the flexor hallucis longus tendon and the neurovascular bundle. Care must be taken not to cut laterally so as to avoid the adductor hallucis. Cutting this tendon may result in a hallux varus deformity. The dorsal incision may be indicated in patients prone to keloid formation or hypertrophic scarring. Saxena found that the plantar incision had a earlier return to activity time versus the dorsal incision. The planter incision allowed for direct visualization of the tendon and the plantar digital nerve to the hallux, while the dorsal incisions had a higher rate of complication including nerve entrapment in two cases. This finding is paralleled in other studies as well. Another possible etiology for sesamoid pain is arthritis of the sesamoid. 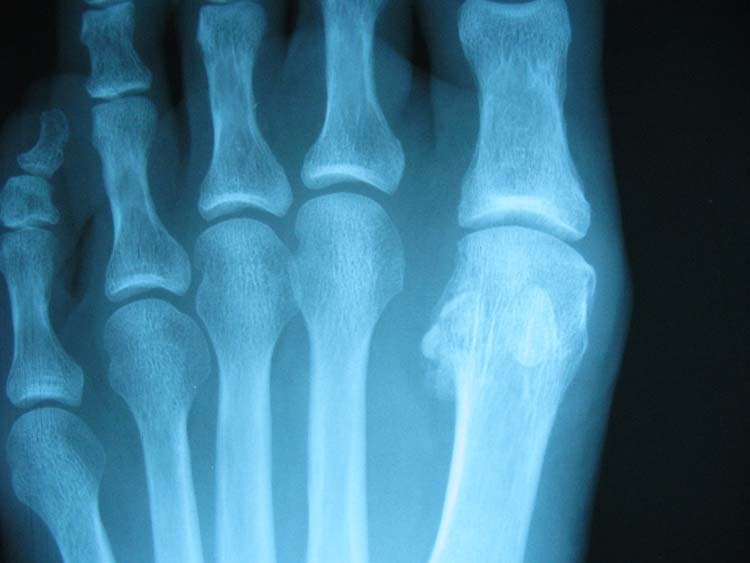 Although the current literature mentions arthritis as a cause of sesamoid pain, the paucity of case studies and research reveals a subject that would benefit from further investigation. The reason so little attention has been paid to this subject seems to be due to the fact that treatment for localized sesamoid pain is the same regardless of the etiology. Our patient had the clinical findings typical of fibular sesamoid AVN including radiologic fragmentation and sclerotic margins of the sesamoid with areas of radiolucency and areas of patchy, increased density. The localization of her pain to the sub first MPJ and the first interspace were good indication that the source of the pain was the fibular seamoid. After inspection of the sesamoid and the MPJ, it was evident that a joint destructive process occurred. Whether the cause of joint erosion is simply arthritis or an articular fracture, the treatment for either is the removal of the painful and dysfunctional sesamoid. Prognosis of sesamoid resection is good. Milia, et al., showed that a few patients were not fully satisfied with their results due to an incomplete resolution of pain. However, all patients stated they would not have changed their decision to have surgery. Saxena, et al., showed that twenty of twenty-four patients were able to return to desired activity and no patients had subsequent trauma to the adjacent sesamoid. Return to athletic activity at full strength after fibular sesamoid resection occurred at average of 9.3 weeks, with one patient who returned at 7.3 weeks. Overall, the fibular sesamoidectomy procedure seems to be highly efficacious after all conservative therapy has failed and when the pain is isolated to the fibular sesamoid. 1. Aper RL, et al. : The effect of hallux sesamoid excison on the flexor hallucis longus moment arm. Clin Orthop Relat Res 325:209-17, 1996. 2. Brandser EA, Buckwalter JA: Imaging studies for diagnosing stress and insufficiency fractures. Iowa Orthop J 16:70-8, 1996. 3. Inge GA, Fergason AB: Surgery of the seamoid bones of the great toe. Arch Surg 27:466-89,1933. 4. Kalweit M, Frank D: Aseptic necrosis of the first metatarsal sesamoid (Morbus Renander) FussSprungg 1:148– 151, 2003. 6. Milia M, Cohen BE, Anderson RB: Plantar approach for isolated fibular hallux sesamoidectomy. Techniques in foot and Ankle Surgery 2(4):268-71, 2003. 7. Pretterklierber ML: Dimensions and arterial vascular supply of the sesamoid bones of the human hallux. Acta Anat. 139:86-90, 1990. 8. Renander A: Two cases of typical osteochondropathy of the medial sesamoid bone of the first metatarsal. Acta Radiol 3:521-527, 1924. 9. Richardson EG: Hallucal sesamoid pain: causes and surgical treatment. J Am Acad Orthop Surg 7(4): 270– 278, 1999. 10. Saxena A, Krisdakumtorn T: Return to activity after sesamoidectomy in athletically active individuals. Foot Ankle Int 24(5):415-9, 2003. 11. Waizy H, Jäger M, Abbara-Czardybon M, Schmidt TG, Frank D: Surgical treatment of AVN of the fibular (lateral) sesamoid. Foot Ankle Int 29(2):231-6, 2008. This entry was posted in Uncategorized and tagged Fibular sesamoid fracture, Uncategorized. Bookmark the permalink.